One is forced to wonder why Lott excludes entire fields of well qualified academics, especially those who work in public health. Also, unlike what Lott insinuated in the debate, all these studies deal with crime on a national level. For a more detailed discussion of why many of the studies Lott includes on his side are fatally flawed, see our previous article on Lott’s work. *Indicates a panel member of the National Research Council. Author of study showing a crime increase. (1) Moody and Marvell have studies showing RTC Laws reduce crime and others that show no effect. (2) Both Maltz and Plassmann have backed away from their own studies showing a reduction in crime. Even according to Lott’s own list of the studies, the number of academics that disagree with him heavily outnumber those on his side. When we include the academics that Lott ignores, it’s not even close. It is readily apparent that the academic community is not on Lott’s side. Lott opens the debate with the bizarre and obviously false claim that ‘No study finds negative effects from RTC laws.’ He then retreats to the safer assertion that no study has found evidence of an increase in murder after concealed carry laws are passed. This too is also false. Let’s examine both the studies that find evidence of crime increases as well as those that find increases in the murder rate (emphasis is added). “Moody and Marvell have given us a single new regression using the Lott county-level data that we corrected back in 2003 and analyzed in Ayres and Donohue (2003b) and that the National Research Council analyzed in its 2004 report. Moody and Marvell use this single regression – a state-specific hybrid model estimated on county data for the years 1977-2000 – to estimate the overall change in the cost of crime attributed to RTC laws for the period that these laws have been in effect for the 24 states they evaluate. Their own table indicates that RTC laws on net increase the costs of crime (albeit statistically insignificantly) in aggregate for 23 of the 24 jurisdictions they examine, but cause massive benefits in the single state of Florida. “Across the basic seven Index I crime categories, the strongest evidence of a statistically significant effect would be for aggravated assault, with 11 of 28 estimates suggesting that RTC laws increase this crime at the .10 confidence level. 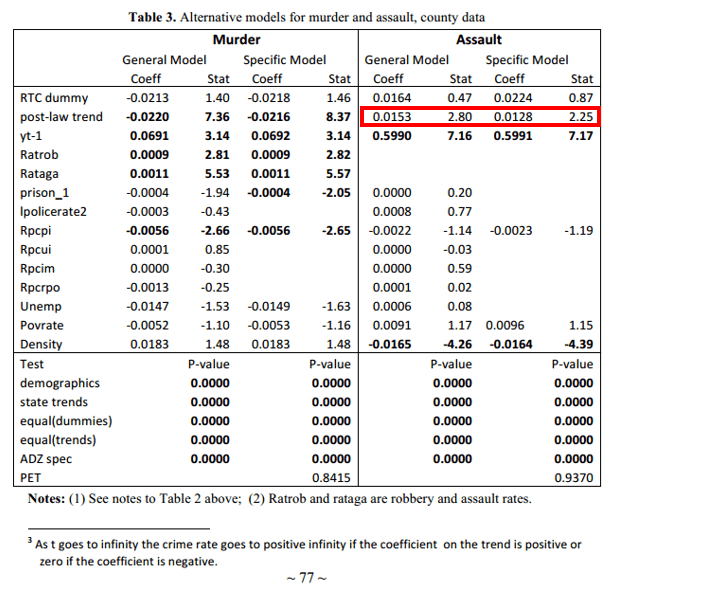 An omitted variable bias test on our preferred Table 8a results suggests that our estimated 8 percent increase in aggravated assaults from RTC laws may understate the true harmful impact of RTC laws on aggravated assault, which may explain why this finding is only significant at the .10 level in many of our models. Our analysis of the year-by-year impact of RTC laws also suggests that RTC laws increase aggravated assaults. Our analysis of admittedly imperfect gun aggravated assaults provides suggestive evidence that RTC laws may be associated with large increases in this crime, perhaps increasing such gun assaults by almost 33 percent. Dr. Moody and his colleagues report that RTC laws decrease murders and there is no significant evidence on both a state and county level for any other crime category. However, they misread their own results, which actually find that RTC laws significantly increase aggravated assaults, providing further evidence that Donohue and his colleagues are correct about the crime inducing nature of these laws. Nowhere in the Moody paper does it explain why a significant T-stat is un-bolded or undiscussed in the conclusion, despite the fact that it directly undermines the thrust of their entire paper. One wonders if the thank you note at the beginning of the paper has something to do with it: “The authors thank The Crime Prevention Research Center for its support.” (John Lott’s organization). Not true. They found, closely following Lott’s model and data, that there was insufficient evidence to support the more guns, less crime hypothesis. To refute a hypothesis, you don’t have to prove the opposite. You merely have to show that the evidence does not support the original claim. This is quite literally Statistics 101—evidence is either sufficient or insufficient to reject the null hypothesis. The conclusion of the National Research Council can be read here. A curious note on page 126 reads, “Through communication with Lott, the committee learned that the data used to construct Table 4.1 of Lott (2000) were lost and that the data supplied to the committee are a reconstruction and not necessarily identical to the original data.” How convenient. To be clear, the reason that the National Research Council’s conclusion contained any ambiguity at all is simply because they followed Lott’s methodology too closely, despite it being riddled with obvious errors. First, Lott’s dataset that was used by the panel had several errors, which Donohue corrects. Both Philadelphia and Idaho, for example, had their year of adoption for concealed carry laws coded incorrectly. Third, and perhaps the most important omission corrected was the lack of clustered standard errors. As Donohue explains, not clustering standard errors (which is now standard practice among econometricians) drastically increases the odds that a spurious result will incorrectly be deemed as statistically significant. When correcting these flaws, which by any objective standard are errors, the conflicting results the NRC model’s show vanish. Instead, there is clear evidence that RTC laws increase crime, particularly aggravated assaults. Dr. Donohue then tweaks the model, using a far more reasonable set of control variables than Lott’s 36 demographic ones along with adding other critical controls that were left out. The results consistently show an increase in aggravated assault. Also during the debate, Lott makes some rather bizarre claims about the most recent study by Dr. Donohue, which shows significant increases in aggravated assaults after concealed carry laws are passed. He mostly relies on the claim that there are massive errors in the Donohue study, and after correcting those errors the results go away. This is blatantly false. Not only does the study Lott cites (and coauthored) not show that the results vanish (it merely points out the errors), but the most recent version of the Donohue study has corrected all of these errors, which had no significant impact on the results. John Lott definition of a “gun-free zone” is intentionally imprecise. He goes to extraordinary efforts to insist that a place is a gun-free zone when there is clear evidence to the contrary. Geneva County, AL: Lott excludes this as a mass shooting because not all of the victims were killed in public, due to the fact that some were killed in their homes. Lott ignores the fact that homes are not “gun-free zones”, either. Lakewood, WA: In Lakewood, four police officers were murdered in a coffee shop by a mass shooter. Lott defines Lakewood as a “gun free zone” even though all the persons killed in the shooting were armed. Lott claims that the presence of a gun has a tremendous deterrence effect on mass shootings, and then simply ignores shootings where every single victim has a gun. The list goes on. It is clear Lott is simply massaging the data to support a particular conclusion. To support his claim that gun free zones attract mass shooters, Lott cites one of his own studies that purportedly shows that concealed carry laws decrease mass shootings by substantial margins. He further provides the examples of the Moncton shooter in Canada and the Isla Vista shooter in California as support for his contention. However, all of this evidence quickly falls apart on closer inspection. A study by Duwe, Kovandzic, Moody in 2002 evaluated 25 RTC laws from 1977 to 1999 and found, “virtually no support for the hypothesis that the laws increase or reduce the number of mass public shootings.” Lott’s mass shooting results simply aren’t supported by other academics, even those like Moody who typically side with him on concealed carry laws. The Moncton shooter Lott references certainly did mock gun free zones. But that’s all he did, mock. When he initiated his attack, he didn’t target gun free zones. Quite the opposite. He targeted the Canadian Mounted Police, and all of his victims were armed. It is bizarre that Dr. Lott would see a mass shooter targeting men with guns as proof of his theory that mass shooters try to avoid men with guns in order to maximize casualties. In the case of the Isla Vista shooter, his motivation was clearly revenge against women for rejecting him. While he did try to plan his attack to minimize resistance, choosing a sorority house as a target clearly reflected his revenge motivation, and his plan to avoid resistance clearly wasn’t well thought out as he was forced to exchange gunfire with police officers twice. The one case that would bolster Lott’s case the most is the Aurora Theater shooting. Here we have case of somebody seeking to inflict the maximum amount of casualties in a well-planned attack. However, this is just one isolated case. And even the gun free zone motivation isn’t as clear cut as Lott would have us believe. If the motivation behind public shootings is the important variable to study, we should examine those shootings in public that fail to reach high casualty counts as well. The FBI has compiled such a study, examining 160 active shooting incidents between 2000 and 2013. In 71 of the 112 (63%) shootings that occurred in commercial and educational areas, the shooters had some relationship with the school or business. If the shooter’s driving motivation is to inflict as many casualties as possible it is really hard to explain this pattern. Further, there are many of these shootings that occur in places typically not seen as gun free zones. The evidence clearly shows that public shooters are not casualty-maximizing machines meticulously planning so as to avoid armed resistance. Instead, these tragedies are most often the result of the shooter snapping due to psychological trauma, and seeking to harm the people they know. Lott’s reliance on falsehoods to carry him through the debate was unfortunate, though not surprising given his extensive history of ethical transgressions which we have detailed previously. Almost all of Lott’s points were either outright false or highly misleading. You can examine the evidence detailed in “Shooting Down the Gun Lobby’s Favorite ‘Academic’: A Lott of Lies” and determine whether Lott is worthy of your trust.